FOLIGAIN® Hair Regrowth Shampoo For Women with 2% Trioxidil® gently removes build-up to rejuvenate hair, invigorate the scalp and add strength, fullness and body back to thinning hair. Infuse your tresses with key nutrients, including our triple action hair regrowth Trioxidil complex, biotin, fruit stem cells, plus powerful herbals and extracts shown to fortify and thicken hair. These ingredients have gone through rigorous testing and research to ensure the best support for hair growth, scalp health and follicle health. 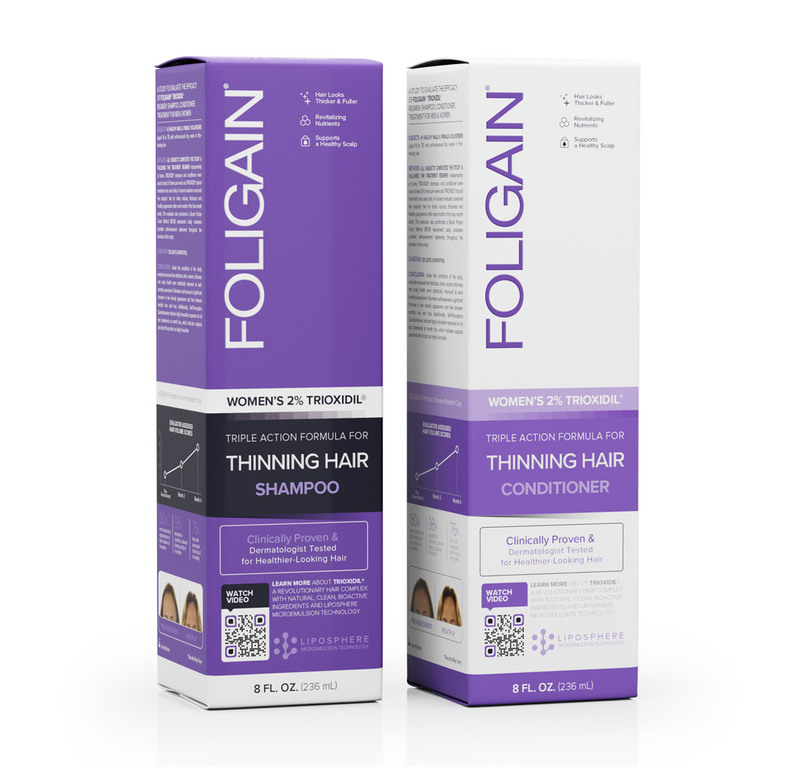 FOLIGAIN® Hair Regrowth Conditioner For Women is a lightweight conditioner that adds new life to thinning hair with nutrients for fullness, volume and shine. Hair and scalp are infused with our triple action hair regrowth Trioxidil® complex, biotin, soothing jojoba oil, plus powerful herbal extracts shown to fortify and thicken hair. These ingredients have gone through rigorous testing and research to ensure the best support for hair growth, scalp health and follicle health. Ingredients: Aqua, Disodium Laureth Sulfosuccinate, Cocamidopropyl Betaine, Sodium Cocoyl Isethionate, Glycol Stearate, Butylene Glycol, Dextran, Acetyl Tetrapeptide-3, Trifolium Pratense (Clover) Flower Extract, Polysorbate 80, Glycerin, Hydrolyzed Jojoba Esters, Citric Acid, Cocamide MEA, Salicylic Acid, PEG-40 Hydrogenated Castor Oil, PEG-150 Pentaerythrityl Tetrastearate, PEG-6 Capric/Caprylic Glycerides, Polysorbate 20, Hydrolyzed Corn Starch, Hydrolyzed Wheat Protein, Hydrolyzed Soy Protein, Foeniculum Vulgare (Fennel) Fruit Extract, Humulus Lupulus (Hops) Extract, Melissa Officinalis (Lemon Balm) Leaf Extract, Viscum Album (Mistletoe) Leaf Extract, Chamomilla Recutita (Matricaria) Flower Extract, Achillea Millefolium (Yarrow) Extract, Equisetum Arvense (Horsetail) Extract, Urea, Allantoin, Tocopherol (Vitamin E), Beta Vulgaris (Beet) Root Extract, Gingko Biloba Leaf Extract, Olea Europaea (Olive) Leaf Extract, Aspalathus Linearis (Rooibos) Leaf Extract, Camellia Sinensis (White Tea) Leaf Extract, Camellia Sinensis (Green Tea) Leaf Extract, Serine, Threonine, Retinyl Palmitate (Vitamin A), Ribes Nigrum (Black Currant) Seed Oil, Moringa Oleifera (Moringa) Seed Oil, Urtica Dioica (Nettle) Leaf Extract, Malus Domestica Fruit Cell Culture Extract, Biotin, Arginine HCl, Phenoxyethanol, Fragrance. Ingredients: Aqua, Behentrimonium Methosulfate, Butylene Glycol, Dextran, Acetyl Tetrapeptide-3, Trifolium Pratense (Clover) Flower Extract, Polysorbate 80, Glycerin, Hydrolyzed Jojoba Esters, Citric Acid, Panax Ginseng Root Extract, Arginine, Acetyl Tyrosine, Arctium Majus (Burdock) Root Extract, Hydrolyzed Soy Protein, Polyquaternium-11, PEG-12 Dimethicone, Calcium Pantothenate, Zinc Gluconate, Niacinamide, Ornithine HCl, Citrulline, Glucosamine HCl, Biotin, Cetyl Alcohol, Ribes Nigrum (Black Currant) Seed Oil, Moringa Oleifera (Moringa) Seed Oil, Urtica Dioica (Nettle) Leaf Extract, Malus Domestica Fruit Cell Culture Extract, Simmondsia Chinensis (Jojoba) Seed Oil, Emu Oil, Phenoxyethanol, Fragrance. Massage into wet hair and scalp for 1-2 minutes. For best results allow the product to sit for another 3-4 minutes so that the active ingredients have time to work. Rinse your hair thoroughly. For optimal results apply at least 3-5 times a week and follow with Foligain Stimulating Conditioner. After shampooing with Foligain Stimulating Shampoo, apply a small amount of Foligain Stimulating Conditioner and massage into scalp for 60 seconds. Rinse thoroughly. So far I really like this shampoo and conditioner. I am now on my 2nd bottle. I had a baby earlier this year and after a few months started losing lots of hair. It's normal to have hair loss after pregnancy but can be a bit scary. So I searched for a shampoo and conditioner to nourish my hair. From the first wash I could feel a difference. My hair felt very clean and light. It didn't get oily like other vitamin shampoos that I have used. My hair is very long and I like that I don't need much to wash my hair. I have less dead ends and a nice shine to my hair. My hair is naturally wavy and this shampoo had made it look much sleeker and not puffy/ frizzy. My regrowth is also filling in nicely. I used this shampoo together with the balsam for about 3 weeks now, about 3 times a week. The shampoo is very delicate so don't expect a lot of foam. The conditioner leave my hair light but soft. I am not sure I will buy them again as quite expensive but I am pleased with both products.